Share Your Trade Show Perspectives! 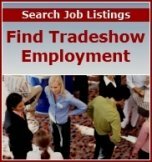 Facing the Trade Show Industry? There's no disputing that the trade show industry is ever-evolving. If you're a frequent exhibitor or have experience working in any aspect of the trade show business, please share your perspectives on where you think the industry is going. What are the challenges and opportunities from your point of view? Thank you for joining this valuable discussion! Please note that this is not the place for companies to promote products, services, or website links (sorry!). If you are interested in advertising information, please click here. Thank you. Enter your comments here. Thank you!